The consumption of water instead of sugar-sweetened drinks can reduce total daily calorie intake. In the IDEFICS cross-sectional sample the consumption of sugary drinks, sweetened milk in particular, was associated with an increased relative risk of overweight and obesity. The lowest intake of sweetened beverages was observed in countries with the lowest prevalence of overweight and obesity. On the basis of the IDFICS results a reduced consumption of sugar sweetened drinks, especially that of sweetened milk, should be emphasised and promoted in future recommendations and interventions. 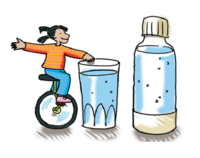 Plain water should be promoted as the main source of liquid for children. Svensson A, Larsson C, Eiben G, Lanfer A, Pala V, Hebestreit A, et al. European children's sugar intake on weekdays versus weekends: the IDEFICS study. EurJClinNutr. 2014;68(7):822-8. Olafsdottir S, Eiben G, Prell H, Hense S, Lissner L, Marild S, et al. Young children's screen habits are associated with consumption of sweetened beverages independently of parental norms. Int J Public Health. 2014;59(1):67-75.